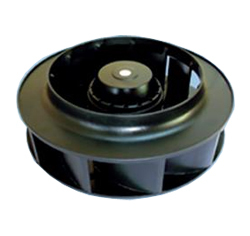 These Fans use Backward Curved Impellers made of Steel or Engineering Plastics. The impellers are press fitted on the External Rotor Motor and dynamically Balanced in two planes. Backward Curved Fans can be used with or without scroll Housing, and find its application in sucking operations, and where static required at Fan Inlet is high.